OUR RESULTS: Thank you for your generous support! 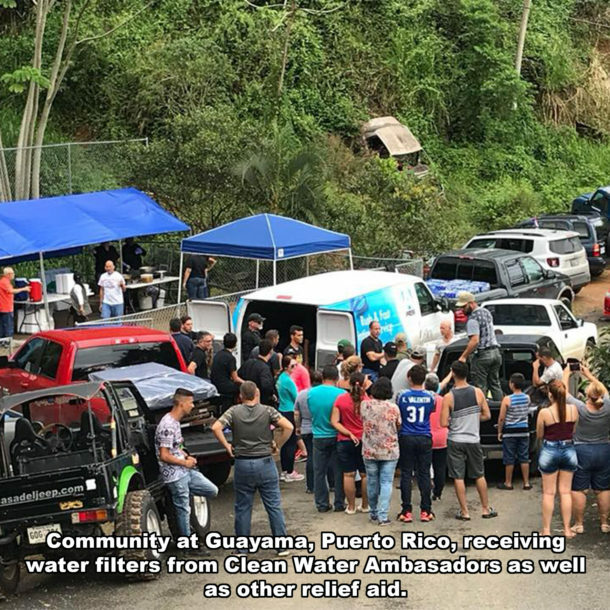 As a result of the donations received, in 2017 Clean Water Ambassadors Foundation was able to deliver 100 water filters to the hurricane ravaged Houston area and Cole Kawana personally delivered 200 filters to devastated Puerto Rico. 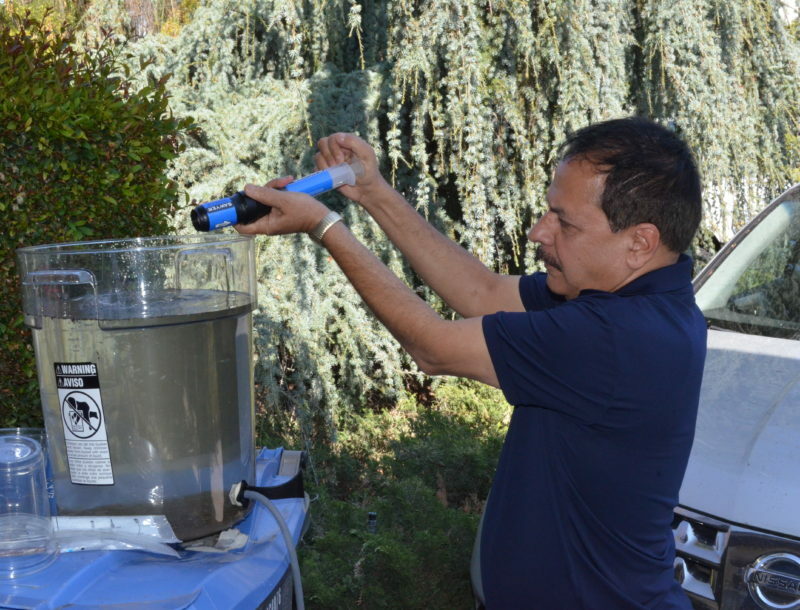 The filters will provide clean water to those in need during natural disasters. Hurricane Harvey hit Texas on August 24, 2017. It was one of the costliest hurricanes in U.S. history causing $125 billion in damages. Harvey was the wettest tropical cyclone on record in the United States. The resulting floods inundated hundreds of thousands of homes, which displaced more than 30,000 people and prompted more than 17,000 rescues. In September, Brooke Kawana met with Dr. Lisa Newell, a veterinary doctor from Malibu Coast Animal Hospital. Dr. Newell was heading to Texas to care for animals that were separated from their owners. 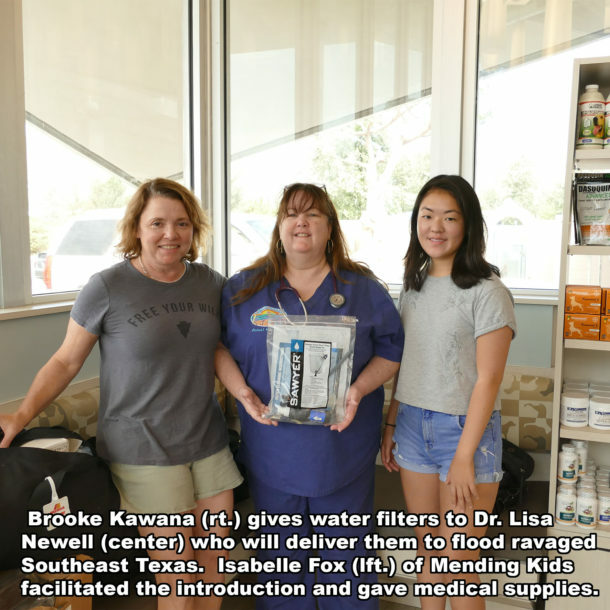 Dr. Lisa took 50 water filters that were given to Disaster Aid USA and passed out near Beaumont, Texas by the Bevil Oaks, Texas Fire & EMS Department. 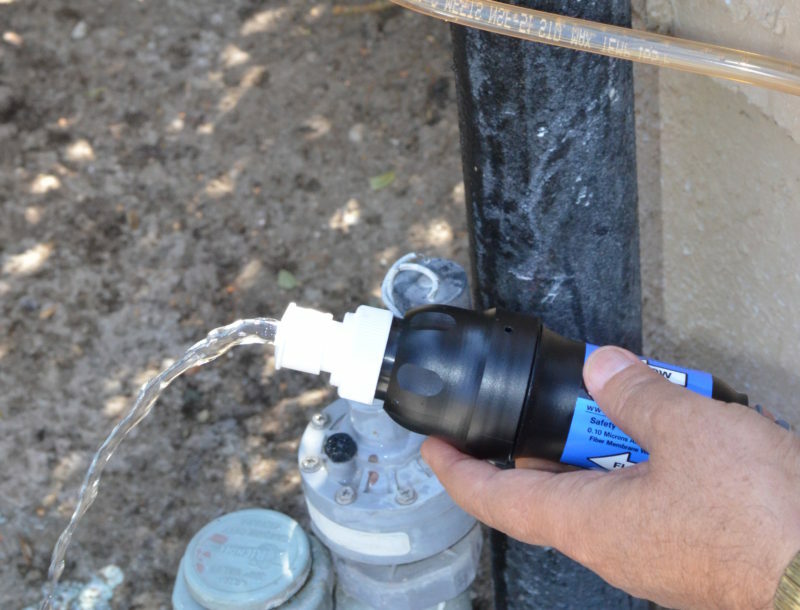 Because of the pressing need, we sent an additional 50 water filters to Disaster Aid USA. Hurricane Maria hit the Caribbean September 18, 2017. It made landfall on Puerto Rico on September 20, 2017 as a Category 4 hurricane. 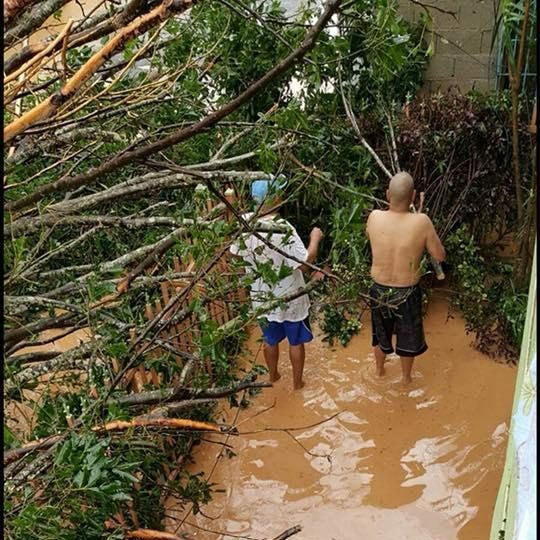 Puerto Rico experienced catastrophic damage and a major humanitarian crisis; most of the island’s population suffered from flooding and lack of resources, compounded by the slow relief process. The storm caused the worst electrical blackout in U.S. history and in June 2018, thousands of homes and businesses were still without power. Cole Kawana connected with Valerie Edmondson Balanos of Warrior Angels Rescue. Warrior Angels Rescue is a nonprofit that coordinates charters to provide evacuation flights to children, pregnant mothers, and other people with urgent medical needs. Hurricane Maria made landfall in Puerto Rico with winds of 155 miles an hour, leaving the U.S.commonwealth on the brink of a humanitarian crisis. 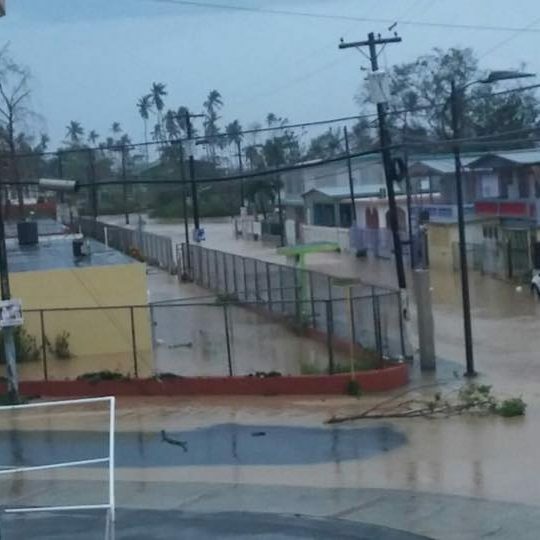 The storm left 80 percent of crop value destroyed, 60 percent of the island without water and almost the entire island without power. We are only now beginning to see the impact and damage that this storm will have on Puerto Rico for many months or even years to come. Established to cut through the bureaucratic red tape, Warrior Angels Rescue sets up evacuations for those most desperately in need. There was no power or clean water on the island so it was essential to get these American citizens to clean hospitals as soon as possible. 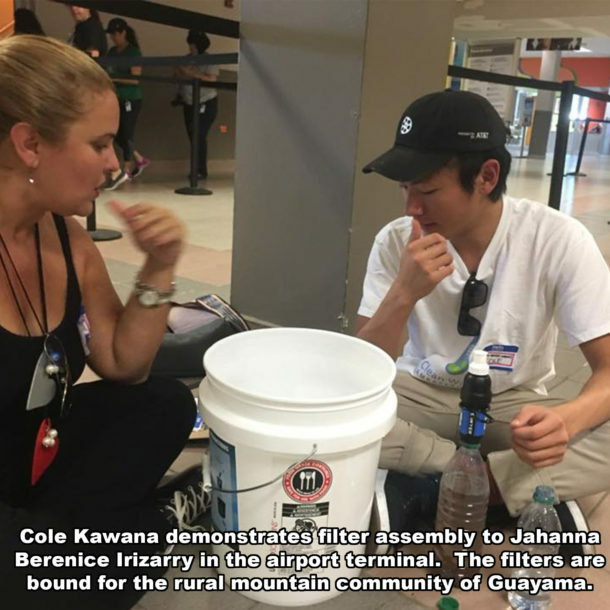 Cole Kawana was able to hand deliver 200 filters on one of the charted planes on December 10, 2017. 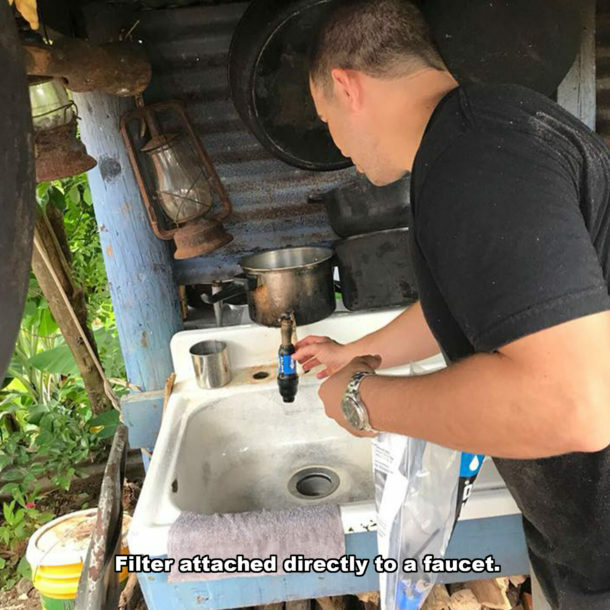 He delivered and demonstrated the filters to Jahanna Berenice Irizarry who took the filters to Guayama, a community in the rural mountains of Puerto Rico. OUR RESULTS: Thank you for your generous support! 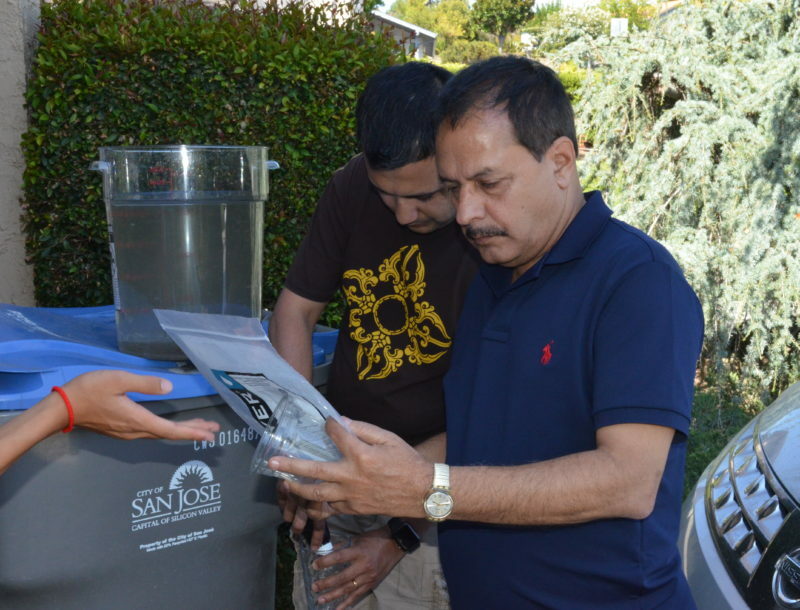 As a result of the donations received, Clean Water Ambassadors Foundation raised $3,000 to pay for 60 water filters that were delivered to Nepal. The filters will to provide clean water for 15 schools. 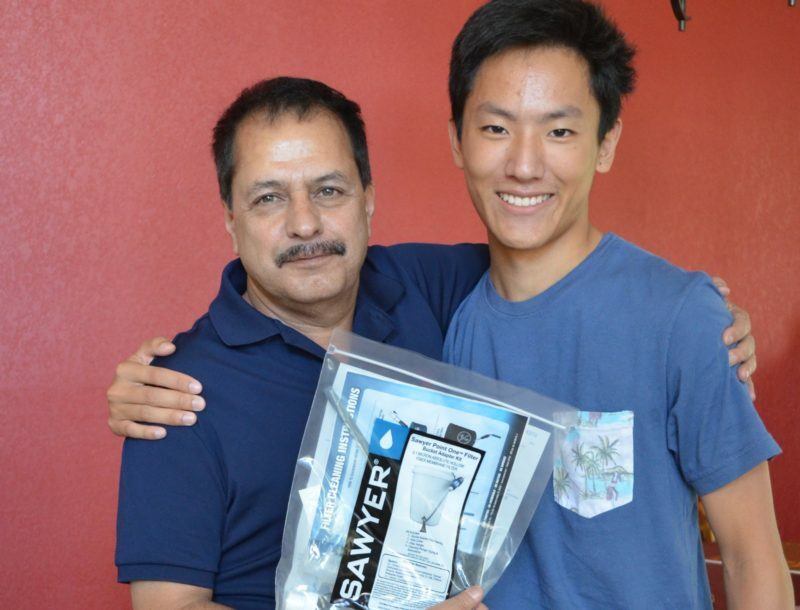 In August, 2015, Cole Kawana personally delivered the filters to Mr. Mahesh Bhattarai while he was on a layover in San Jose, California visiting family en route to Nepal. Mr. Bhattarai founded the General Welfare Pratisthan (GWP) in 1993 to promote the socio-economic empowerment of women. GWP works to educate the community about sexually transmitted diseases such as HIV/AIDS, reduce the number of girls who are trafficked to neighboring countries like India, and provide girls with business education, mentoring, and micro/small business loans. GWP is actively working in 20 districts in Nepal and has reached more than 500,000 beneficiaries through its outreach programs that focus on income generation, health improvement, education, and the environment. On April 25, 2015, a devastating 7.8-magnitude earthquake struck Nepal near Kathmandu. Avalanches were reported in the Himalayas, including on Mount Everest. Then on May 2, a second 7.3-magnitude earthquake struck near the capital as well. The earthquakes killed more than 8,800 people, destroyed nearly half a million houses and damaged another 280,000, leaving thousands in need of food, clean water and shelter. GWP is distraught that the earthquake wiped out 100 schools in the area. We were introduced to GWP by Scott Fifer, Founder of Go Campaign. 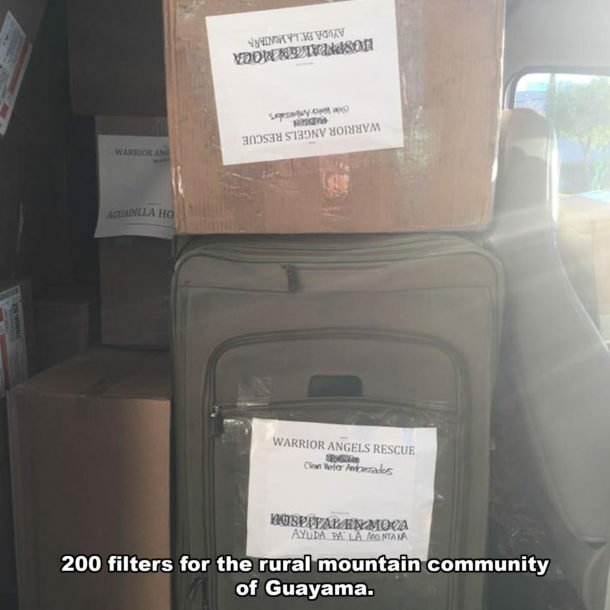 Because of Go Campaign’s long-time partnership with GWP, we knew that these filters would reach the earthquake victims directly. With funds provided by the Go Campaign, GWP will be rebuilding 15 schools whose water supplies were damaged. The schools have a total of 37,000 students. Clean Water Ambassadors’ water filters will serve these students. Support the Clean Water Ambassadors Foundation. Your generous donation will enable us to provide water filters to communities in need and expand our areas of impact. Clean Water Ambassadors Foundation is run exclusively by volunteers. 100% of your donation goes directly to purchasing water filters. 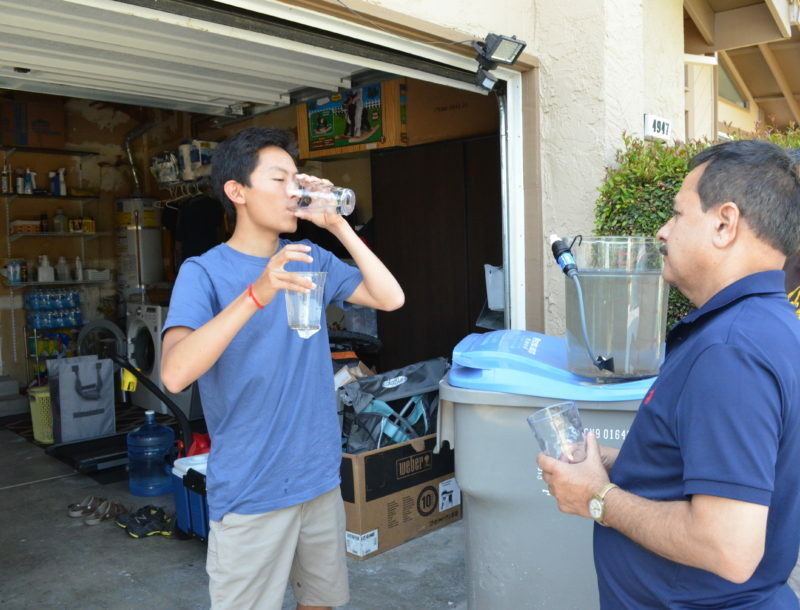 One $50 filter can provide 100 people with clean drinking water for up to five years. Five filters ($250) can provide enough clean drinking water for a small primary school or medical clinic. 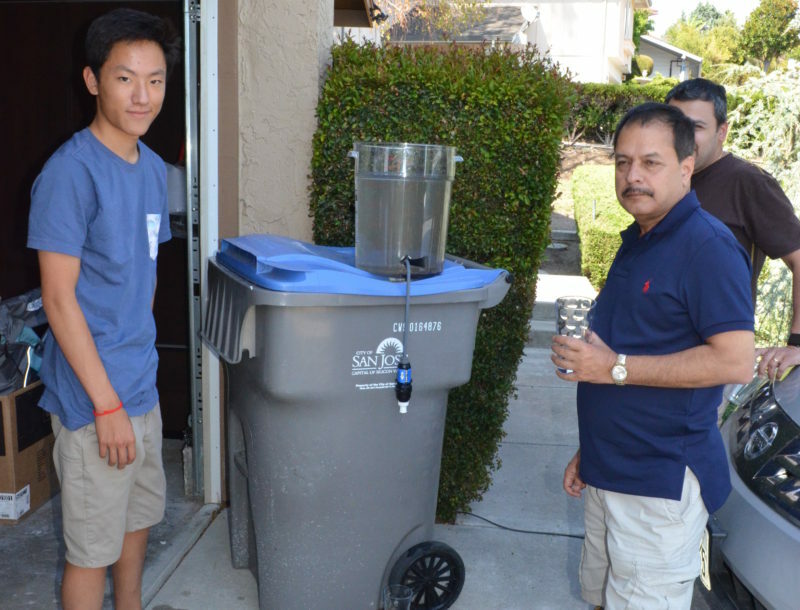 Ten filters ($500) can provide enough clean drinking water for a small village. May 9, 2014: Rutunga, Rwanda, Aspire Women’s Center – Octave Shyaka demonstrates water filters delivered by a Clean Water Ambassador.